San Francisco-based Sunrun’s staff in Denver soon will be basking in a new downtown office. The company, which installs solar panels on homes, has leased 118,000 square feet at 717 17th St., and expects to move in this June. Sunrun first entered Colorado in 2010 with an office in Westminster. In 2015, the company leased 35,600 square feet at 1515 Arapahoe St., and said it planned to hire 800 people in Denver. Stewart said Sunrun has 4,000 employees around the country, but she declined to disclose the Denver headcount. The company currently has four offices across in Denver, at 1515 Arapahoe St., 1201 16th St., 1630 Welton St. and 707 17th St. — a total of about 85,000 square feet. Operations at those locations will move to the new office. 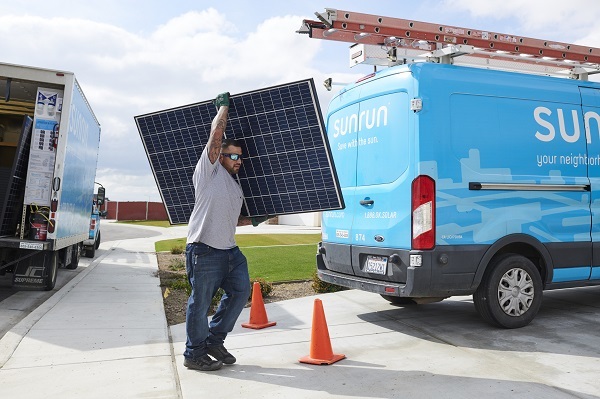 Sunrun, founded in 2007 in San Francisco, went public in 2015 and now has 230,000 customers in more than 20 states, in addition to Puerto Rico and Washington, D.C.
Customers can either buy or lease solar panels from Sunrun. “They have the option to buy it outright, or they have the option, as more of our customers do, to lease it over time,” Stewart said. The company also sells a solar power storage system called Brightbox. Other tenants at 717 17th St. include vacation rental startup Evolve Vacation Rental Network, which occupies 72,000 square feet. Sunrun’s lease was the second-largest office lease signed in the Denver market in the first quarter, according to a report issued Monday by brokerage Savills. Amazon took the No. 1 spot. The company’s lease at 1513-1530 Wynkoop St. — first reported by BusinessDen in February — is for 125,000 square feet, according to Savills. Only five buildings in the Central Business District have available space greater than 100,000 square feet, according to the report.